A new concept in HMI and Teach Pendant technology is almost here. Advanced hardware with an Android operating system and a WYSIWYG user interface design dashboard provides you with a smarter way to design HMI GUI. We think you'll agree that this new concept is the smartest way to interface. Fully leverage the user interface development platform tools to reduce software development time and cost. 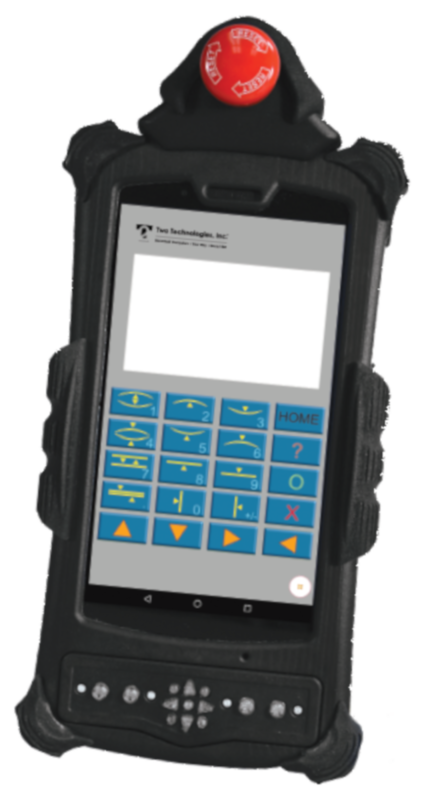 Create your own HMI with custom GUI keypads, custom key outputs and custom labeled keys on our rugged Android device. With the GUI tool, developers can now quickly build a new user interface and/or easily move existing end-of-Life or legacy HMI applications onto our rugged device. Top tier 7-inch tablet with full-color, touchscreen display. Optional E-stop to meet safety requirements. Comfortable and fatigue-free handling by right- and left-handed persons. Front mounted, 9-button hardened tactile keypad available. Serial port for RS-232 communication. Infinite combinations of colors, text, displays and keypads available. White Label the GUI with your company’s logo or product branding within the display. Deploy the custom interface on multiple hardware devices. Store and update the custom interface in seconds over the cloud for added security. Embed hyperlinks directly into the interface to content such as stored or web based manuals, documentation and internal information for access by end users on the floor or in the field.